Deb's Cup of Tea: Beat it With a Stick! I spent the weekend cleaning. I clean a bit every day, but this was a weekend to deep clean. It was in the negative temperatures, with wind chill, and, on Sunday, we got 3 inches of snow. I wasn't going anywhere and there has been a lot of "crunchiness" to the floor. The litter box area was thoroughly cleaned and scrubbed, with new litter and a new litter box. One of our usual boxes was taken to the basement to be scrubbed. Pilchard has a tendency to register displeasure with anything by peeing outside of or just on the edge of a box. There has been a lot of that since my California vacation. I've scrubbed the box area, changed the litter and she still seemed to be peeved. I don't know what triggered the thought but it occurred to me that I hadn't rotated out the actual boxes and scrubbed them. There was an old one in the basement that I'd forgotten about. I used to be really good about this, rotating a completely cleaned box out once a month but had not done this all last year.I couldn't smell anything, but I don't have a cat's sensitive nose. It was time to get back into thorough cleaning. The old box went downstairs to be soaked. I put it in the wash tubs with some Dawn dish soap (Is there anything this soap doesn't do?) and as the washer spins the water out of the laundry, it scrubs the box clean. I just follow up with some minor washing. Since swapping out one of the boxes, there hasn't been an on-purpose mistake outside the box. I'll need to swap boxes over the next month so all three are clean heading into spring. You should have one box per cat and one spare. After doing that, I set my sights on other rooms. The weekly sweeping just didn't seem to be getting all the winter grit so I gave the mop a good shake and started with my bedroom, working toward the front of the house. I have to take a break every so often and, when I sit in the office, I can see into the bedroom and partially under the bed. I thought I'd swept under there, but there was a shadow. When I took Mija to the vet, Pilchard had dashed under the bed and into the office closet to avoid what she was sure was her turn to ride in the carrier. She pulled a long string of a dust bunny from under the bed. So, I paid attention to that spot. But this shadow, which was NOT a cat, I checked, seemed to indicate something else was under the bed. Maybe it was a missing sock. I got down on my knees, a daunting prospect because I never know how easy it will be to get up, and ran the mop under the bed. The first two passes yielded 3 cat toys and one sock. With the third pass, I aimed toward the head of the bed which is up against the wall. I swear I had swept that area but this came out. It occupies the same amount of space Mija does, although it is not sentient nor does it have her mass. I think what happened is that my previous passes just shoved amounts of dust and fur and hair and whatever else goes into dust bunnies, up against one of the bed's legs. I was scraping off the mop what I had swept from under the bed. The angle I used on Saturday's pass pulled all this out. I'm not really grossed out by this. Fascinated is more the correct term. There's very little grit in this. When I dusted it up to toss into the garbage, the dirt left was a couple of teaspoons and that was more loose litter, which I kind of expect. One of my friends, upon seeing the photo, said I should give it a name and suggested "Charlie"; not sure why but there it is. No, I am not naming my dust bunnies. 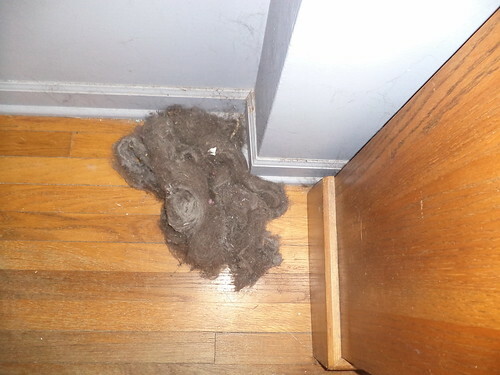 Come spring, when I move furniture for spring cleaning, I wonder how big some of those dust bunnies will be. Will I have a whole family? I read somewhere that birds like to have you toss this kind of dust outside in the spring because they use it for nesting. Um...no. Sorry chickadees. This is going away.